English muffins somehow remind me of mcdonalds. I remember my parents use to buy big breakfast from Mcd only on weekends. And I'd often consider this a 'luxurious' breakfast as having mcd on regular days isn't the norm for the family. Big breakfast as simple as it is yet really heartwarming in many ways - Scrambled eggs, meat patty, english muffins & hashbrown. Thats when I thought of recreating this experienceby making my version of english muffins at home. 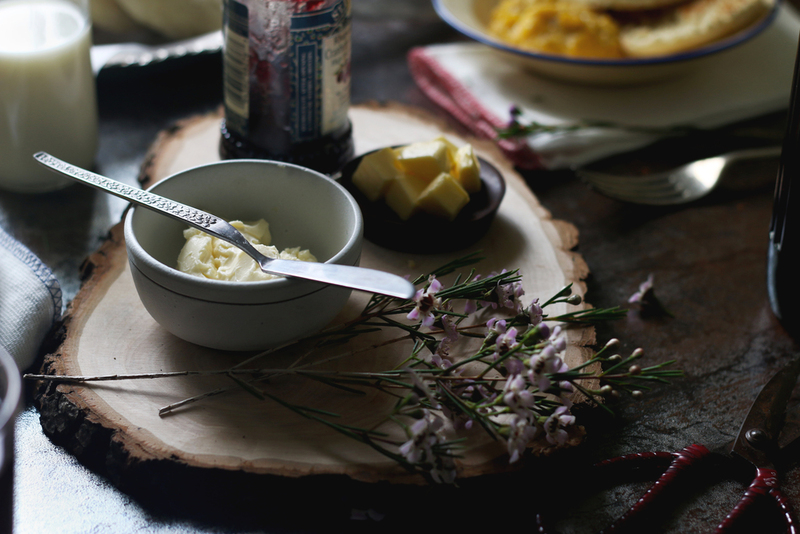 For that, I use buttermilk instead of regular milk which adds a touch of acidity to this lovely english bread. 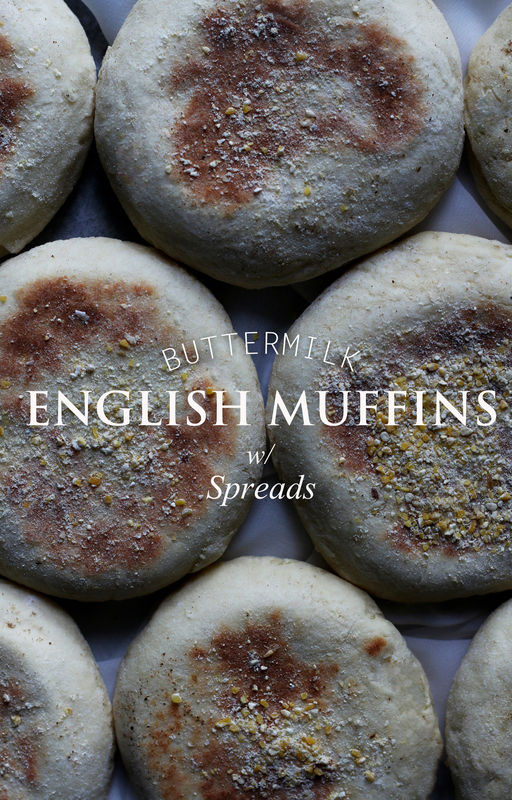 A batch of these english muffins easily store up to 4-5 days in the fridge. Simply warm it up in a microwave or have it toasted in a oven. 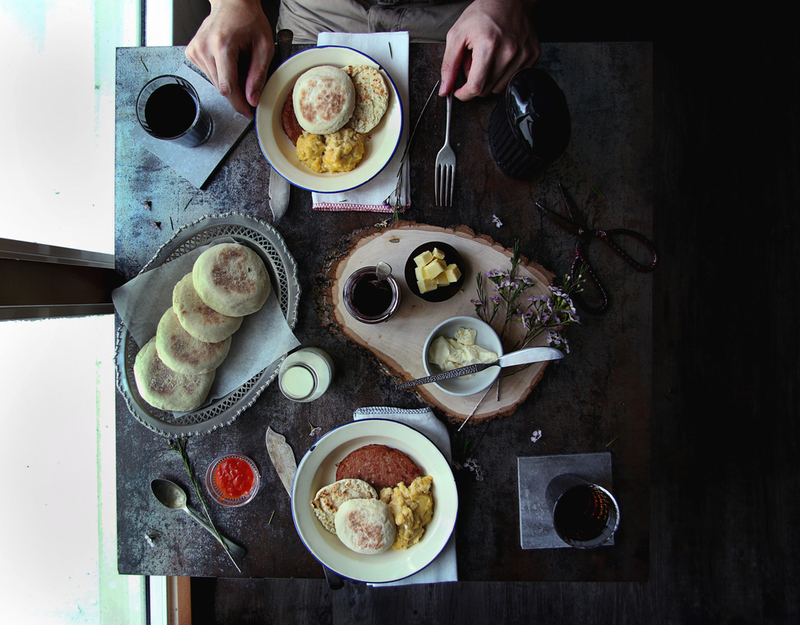 Imagine breakfast with homemade english muffins right from scratch & scrambled eggs, jams or even eggs benedict to go with! Perfect isn't it? You definitely should try this at home, it's not difficult at all, though a little time consuming but I guarantee you'll enjoy it! Warm the milk to 50C/100F using a microwave or saucepan. Combine the yeast, sugar & salt with the milk. Set it aside for at least 10 minutes. There should be visible foamy bubbles on the surface of the milk which means the yeast have been activated. Sift the bread flour and baking powder in a separate mixing bowl. Dig a well at the centre of the flour and pour in the yeast milk mixture and oil. Mix the flour from the sides in with the yeast mixture using a spoon or spatula, you can do this with a stand mixer if you have one. Once the dough come together, start kneading for a few minutes till it doesn't stick to the sides. Transfer the dough onto a floured surface and begin kneading it by using a pressing motion on the dough back and forth. Knead until dough becomes smooth which takes about at least 20 minutes or so. Adjust with water if the dough is too dry. If using a stand mixer, have it kneading on medium speed for 20 minutes. Thereafter leave the dough to proof in a bowl covered with wet towel in a warm environment for about 60 minutes. After 60 minutes, the dough should be doubled in size (varies depending on the environment). Transfer into a well floured surface and divide into 8 equal portion. Roll it into ball size and flatten it - when rolling, tuck in uneven surface, nooks and crannies on the underside until ball surface is smooth and round. Dust cornmeal on a tray and place the dough balls on it. Leave it to proof for another 30 minutes. After the second proofing, on a skillet/griddle, toast both sides of the flattened ball till brown on both top & bottom surfaces. Then transfer the toasted flattened ball into a preheated oven 160C/320F and bake it for 10-15 minutes until the muffins are fully cooked through. To halve it, run a fork in around the sides this help to create air pockets in the bread instead of using a bread knife. I served mine toasted with some cream cheese spread, blueberry compote & butter. I also had scrambled eggs & pan fried spam slices to go along with. Puffing hot right from the oven and the acidity from the buttermilk really help to warm up the appetite especially in the morning. Enjoy!